Danny the Dragon fans are the best! Hearing from them lights up my day like nothing else! 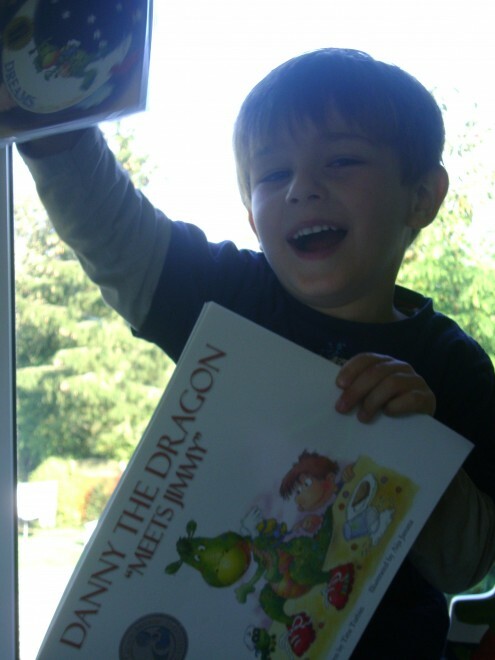 Recently a family purchased the Danny the Dragon set (the Danny the Dragon Meets Jimmy softcover book and Danny the Dragon DREAMS CD). The mother, Chantelle, wrote in to tell me how happy her son Rohan was with his set, and she even sent me PICTURES! 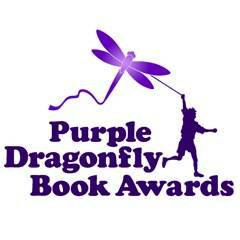 Danny the Dragon Author Showcased in Society of Children’s Book Writers and Illustrators! See great article in the Dunedin Beacon about Danny the Dragon and Author Tina Turbin! We are so honored to be showcased in this paper! 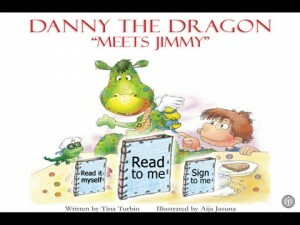 Ever since Tina Turbin, the multi-award-winning children’s author, released Danny the Dragon Meets Jimmy, the first book of her illustrated kids book series, she has been recipient of critical praise, numerous awards and honors, and media attention. The release of her book was followed by that of a Danny the Dragon Meets Jimmy iPad and iPhone app, the first one for the hearing impaired, featuring a reading of the author’s acclaimed book with sign language interpretation. Now the author is generating even more media attention with her app than with the debut of her book, as coverage of the groundbreaking product is appearing in some of the leading news blogs in the publishing world, specifically Alice Pope’s SCBWI Children’s Market Blog and MediaBistro.com, the global web resource for media professionals. A passionate literacy advocate, I was alarmed by the literacy statistic among the deaf, and now I’ve begun raising support for education for deaf children. Upon the release of my Danny the Dragon DREAMS, the proceeds of my Danny the Dragon DVD, which features a signed reading of the book for deaf children, will be donated to the local deaf children’s school, Blossom’s Montessori School for the Deaf in Clearwater, Florida. I’m very happy that I’m able to do something to improve deaf education! If you’re like most Americans, you probably haven’t even heard of celiac disease, an autoimmune disorder which causes an immune reaction that can affect the entire body, causing both physical and mental problems. The cause? An allergy to gluten, a component of wheat, barley, and rye. The problem with celiac disease is that doctors don’t know much about it either. They don’t know that it affects an estimated 300 million Americans and that with a simple test, a diagnosis can be made and the easy treatment can begin—a gluten-free diet. As an active literacy advocate, I do as much as I can to get kids reading to revert the literacy statistic of this country. However, it wasn’t until recently that I became aware of another alarming statistic—the literacy rate among deaf children. Disney, in none other than lovely Florida! Sunset Park Elementary School, located in Windermere, Florida, welcomes author Tina Turbin to share her Danny the Dragon book with over 500 students, teachers, and parents. She will sharing her work with large groups and will talk about what it is like to write children’s books. In January, Danny the Dragon will make a return appearance when the school cafeteria celebrates “Appreciate a Dragon Day”- January 16th, so mark your calendars. If you’ve been keeping up with me as the children’s author of the Danny the Dragon series, you’ve probably heard me talk about the new Danny the Dragon CD, which is soon to be released, containing a reading of Danny Meets Jimmy by a talented vocal artist followed by a compilation of ten original classic songs by up-and-coming composers. What’s great about the CD is that, as with the book, it can be enjoyed by people of all ages—the young and the young at heart. What’s even better, though, is the fact that the proceeds are going to a cause which is near and dear to my heart in my research and humanitarian efforts, a cause that you may not know much about—raising celiac disease awareness.